Yakkity Yak - Why can't we be France? In our search for what livestock are right for us, I heard a lot of good things about yak. These Tibetan relatives of the typical cow are quite beautiful and unique! Like buffalo, they have leaner meat and can produce a useable milk. I was delighted to find out that Hooper’s yak ranch, home of one of the largest herds in the U.S., was in Minnesota. Thanks to the graciousness of John Hooper, we were able to visit and meet the yak this past spring. I can’t wait until we can get our own babies and start a small herd! It's still a few years off but I'm excited already. The yaks were very tame and personable! I love their fuzzy tails so much. Me posing with one of the females. Jericho’s horns were so heavy they have developed this unique downward curve. A yak/cow hybrid – hence the brindle coloration and different look. Hybrid yaks grow more quickly and larger than purebred yak. Jericho’s size and calm demeanor were amazing! One really appealing thing about yak is that the females do not have to be milked when they are producing - they will only 'let down' what is being used, so unlike a dairy cow, which is a huge commitment of time during her productive period, you can get small amounts from a yak when you want it. We don't consume a lot of dairy and mostly want milk for making cheeses - so this is a great compromise! I would like to eventually get a few babies to bottle feed, once we have our fence completed and set up for animals. John is actually able to ride some of his yak and has traditional ceremonial garb for them. He was a really kind man and also showed us his collection of Tibetan artifacts. After our trip to the farm we had a fantastic lunch at a restaurant who used John's yak meat, a Tibetan place in Minneapolis. It was delicious! We also brought home some meat and made burgers and a roast - it was delicious, much more flavorful and lean than cow meat but not altogether different. http://www.yak-man.com/ – The yak man offers yak meat as well as animals for sale. If you’re in the midwest and interested in yak I highly recommend contacting him! 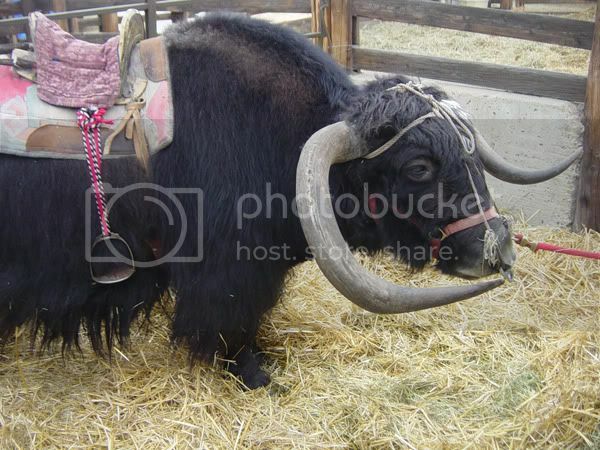 Tibetan yaks are fabulous and I understand make great livetock for thos not wanting to make a huge commitment. Might I suggest highland cattle my very favorite cattle breed. So beautiful and also low maitence I understand. Looks like you had a fabulous visit! That is Jericho when he was younger and John riding him! :) He is head of the national yak club and goes to show at the stock show each year. :) Awesome pics! That is too funny and awesome!!! I also got to try yak meat at their yard area, it was yummy! This was the 2007 show. PLEASE tell me you will follow suite and get them some saddles! 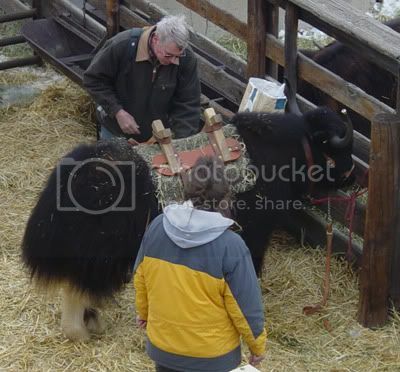 It would have to be a huge yak to hold me, but I'm super tempted to try to be the first person (that I can find anywhere, at all) to ride a musk ox! Cool. Very good idea to have livestock that are suitable for the MN climate. They actually aren't as perfectly suited as I thought they would be - despite their long coats they are more cold, arid desert type animals and have a hard time with our dense snow and humid summers. They are more prone to skin conditions and problems than they are where they are raised in Colorado, Wyoming and out west - more like their native tibetan mountains! 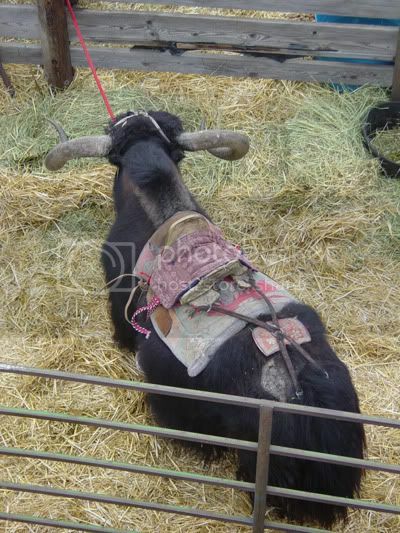 I was going to mention Dzo-(the yak cross) and there you have Photos!! What kind of cow was used for this hybrid? I know that the owner told us, but I can't remember - I know they were beef cattle types but I don't remember the breeds. I guess they are more commonly used for meat production due to the quicker size growth/general larger size. I'd like to have pure yaks but the hybrids had some really neat colors! Oh my. Having grown up with cows, I've always had a great fondness for them, but yaks have definitely just added themselves to my admiration list. Wild yaks are actually quite a bit bigger, but the domesticated ones are surprisingly small. We didn't buy any for our farm, yet, because we don't have proper fencing. But we hope to add some in the future, when we are ready! Thank you for your kind words, I'm happy you like my journal! Those guys are so adorable... just big, hairy adorable!!!!! As always I have to applaud and support the authenticity of your adviser, as well as your intentions. It's such a RELIEF to see people going about things in a very traditional sense. I hope you get your Yaks soon! !